We are taking PPG off our favorite list and moving to a neutral/negative position on the group. 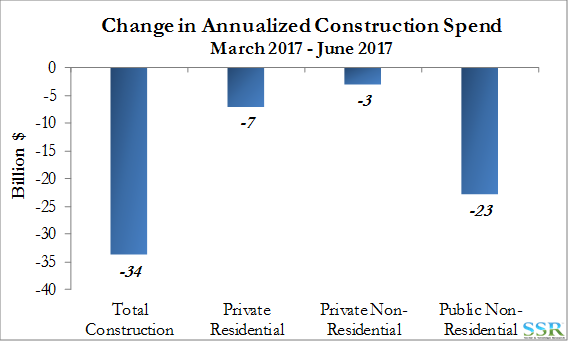 We think that fundamentals are peaking in Autos and Architectural and that there is some longer term “disruption” risk in both sectors. The M&A response that this should trigger is hard to invest in, because it is unclear who will be the buyers and the sellers – you want to own the sellers (with PPG the exception only if it can get Akzo at a reasonable price) – AXTA and RPM are the most obvious sellers. 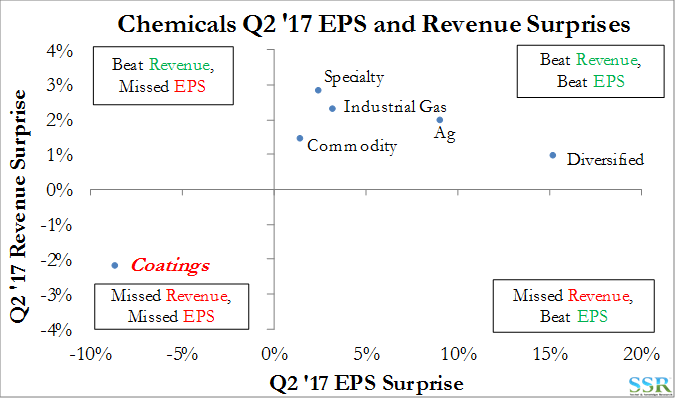 The path to Q2 2017 (Exhibit 1) is reminiscent of the Industrial Gas path in 2013/14, culminating in revenue and earnings misses in Q1 2015. This sector unperformed by roughly 10% from Q1 2015 until the PX/LIN deal was announced. Both near-term and longer-term challenges exist for Coatings. 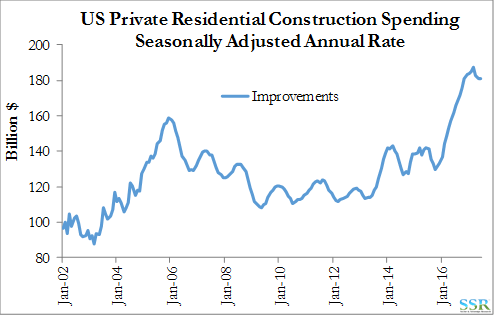 Near-term with slowing housing demand growth and share gain from the DIY stores, as well as a peaking auto cycle. Longer-term from possible disruption in both segments – paint distribution, demand, properties and application in Architectural and autonomous driving in Autos. PPG’s move for Akzo, we believe, was appropriate and recognized a future that may look very different with and an attempt to get scale in European architectural. More tailored, application specific, Industrial Coatings may be the one segment where scale and focused R&D may provide good growth for the incumbents as it is less at risk from disruption; moreover, the smaller players will not be able to keep pace with the leaders and should sell. Our view of optimal strategic paths for the majors and the stock conclusions are summarized as follows – in some cases we think defense will be a stronger driver than offense**. SHW – Continue to consolidate – maybe AXTA or Akzo – estimates look too high – expensive. PPG – Go back again for Akzo – otherwise smaller deals – Architectural and Industrial. AXTA – Sell now! 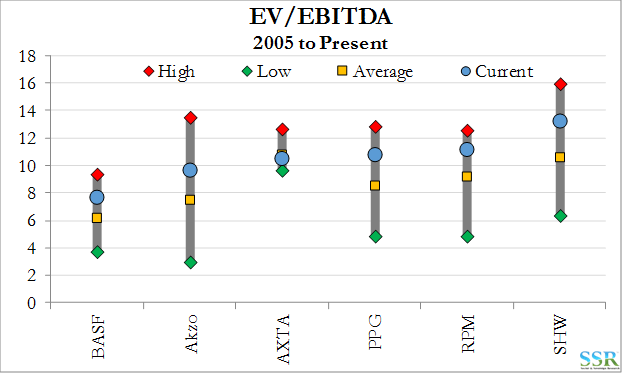 Valuation peaking! The current acquisition strategy is not working. Akzo – Also sell now – same reason – risk that Akzo buys AXTA to stay independent. BASF – Focus on Autos – sell LATAM Architectural – stable. RPM – Sell – hard to see a good go it alone strategy. The possible permutations in the Coatings space are more complex than the potential outcome of Game of Thrones appears today. What is likely inevitable is change, driven by slowing fundamentals and potential disruption in the business model itself as well as with at least one of the major customer groups, automotive OEM. But who ends up buying whom, merging with whom, etc., has many possible outcomes, which makes investing in the sector quite risky. If Azko lets itself be acquired, it has upside. If it pursues acquisitions – especially something as large as Axalta – it likely has downside. If PPG buys Akzo, there are likely enough synergies for the company to generate some good growth for several years. If PPG has to compete for Akzo with SHW, then the company could either lose the deal or pay too much. With no large deal, PPG may not have the ability to buy enough smaller properties to offset possible business slowdowns and margin compression. AXTA should sell, but there may not be a buyer at current values, especially if there are doubts about the future shape of the auto industry. Smaller companies should probably explore the idea that the market might be peaking or plateauing and look for the right deal now. Even in the more fragmented Industrial Coatings space it is likely that those with the size and the scale of R&D will be able to keep up with a more rapidly changing market – driven by a more informed and more demanding customer. BASF looks like the only investment in the space that does not have some sort of unpredictable risk – either because of a decision not to sell or a decision to pay up for a very expensive acquisition. There could be some big winners for those companies that are acquired. 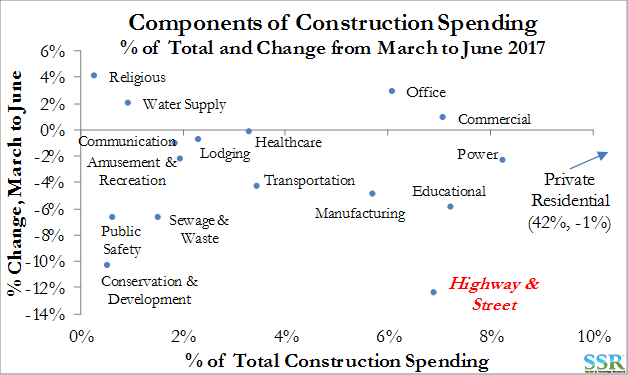 As we indicated in our most recent Friday Findings, US Construction Spending is rolling over – Exhibit 2 –and while “Highway and Street” is the most significant piece of the decline – Exhibit 3 (and possibly quickly rectified by an infrastructure bill) – private residential is also a negative. 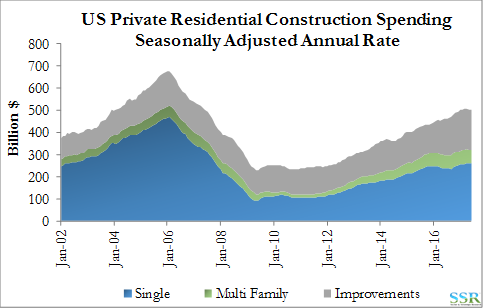 US private residential new construction continues to rise on the single-family side – Exhibit 4 – but has rolled over in the multi-family unit segment – Exhibit 5. The new construction side of the business is not nearly as material for the coatings companies as the refinish market – Exhibit 6. 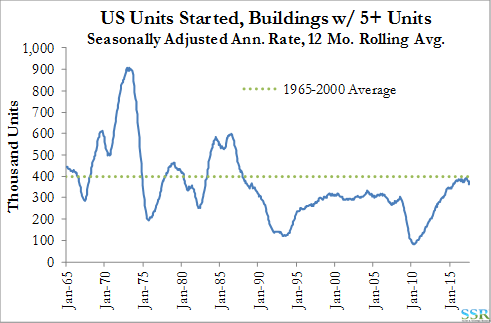 Exhibit 6 likely overstates the importance as the bulk of new home builds in the US are more standardized units and generally the paint used is lower margin for the producers. The more important segment for the architectural paint companies is the home improvement space, where consumers are willing to pay for more sophisticated and higher value paint – durability – color choice, color match, etc. As shown in Exhibit 7 and again in Exhibit 8, this spending also appears to have peaked. 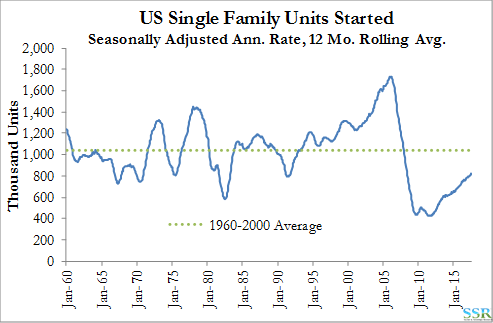 Given that the primary driver here is the finance rate, which drives both home turnover and refurbishment, and that refinance rates have now been at all-time lows for almost a decade, it is hard to see what will stimulate demand recovery here – except perhaps lower pricing. While we think about the US Architectural Coatings business as consolidated, it really is not consolidated enough to prevent price erosion – there are three major store/franchise operators – SHW, PPG and Benjamin Moore – as well as two pan-US DIY chains (Home Depot and Lowes) and plenty of other smaller chains and independents, buying branded paint and other coatings from the majors and Masco and RPM. At the time of writing Home Depot is offering premium BEHR (Masco) paints for $24 per gallon, while Sherwin Williams is offering its “everyday” range – its lowest for $8-10 more, with its premium paints selling for as much as $80 per gallon. In the “everyone knows everything” world of social media, star ratings and “how to do videos” it is not clear to us how sustainable these price differentials might be. 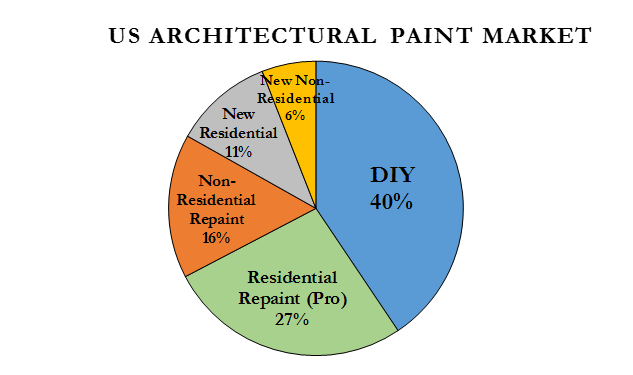 A contractor/professional painter may prefer to go to his local Benjamin Moore or Sherwin Williams store, but he cannot do so if his customer demands that he goes to Home Depot or Lowes because a: they want the savings, and b: on-line reviews suggest that the quality trade-off is minimal. This is a much bigger risk for SHW than PPG because SHW’s incremental margin is so much higher. 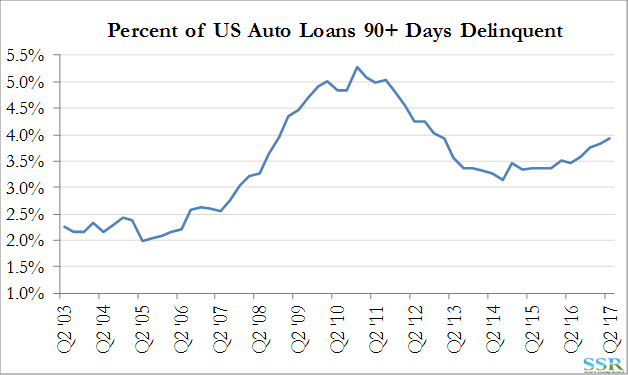 The US automotive chart in Exhibit 9 speaks for itself; it looks like we have peaked after years of cheap lending. Europe may still have some growth, but we suspect not much. In automotive OEM, as we have written before, we now have three strong competitors with PPG, Axalta and BASF all offering high value complete solutions to automakers all over the world – they are competing with each other on a much more level playing field than in the past, mostly because of a refocused Axalta and it is now more about not losing share in the faster growing markets in Asia to new locals. Longer-term we see disruptive risk in the space as we do not believe that the winner in the autonomous driving space will be an incumbent in the industry today. Should we evolve to a world of “TaaS” (Transport as a Service) with fleets of driverless units, it is highly unlikely that they will look like the cars of today or be made the same way or of the same materials. The conventional OEM paint shop may get marginalized and be replaced with single (likely bright) color injection molded plastic. We are years away from this making a meaningful dent in the traditional market – but when seismic change like this comes – it happens faster than any of the incumbents expect. Near-term, the rise in loan delinquencies (Exhibit 10) in the US is a concern but not a major risk. It does support the idea that OEM sales in the US may have peaked for a while. 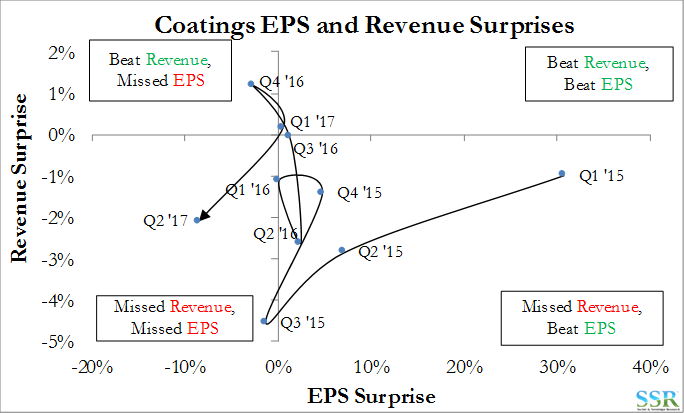 In Exhibit 11 we show how the US Coatings sector has performed in recent quarters – it is a time series of the single data point in Exhibit 1. It is interesting to note that the sector has either just met or missed revenue expectations consistently, despite having some strong EPS wins, notably after raw materials fell in late 2014. In the past, we have drawn comparisons between where we think the coatings space is today and where the Industrial Gas industry has been for many years – ex-growth. 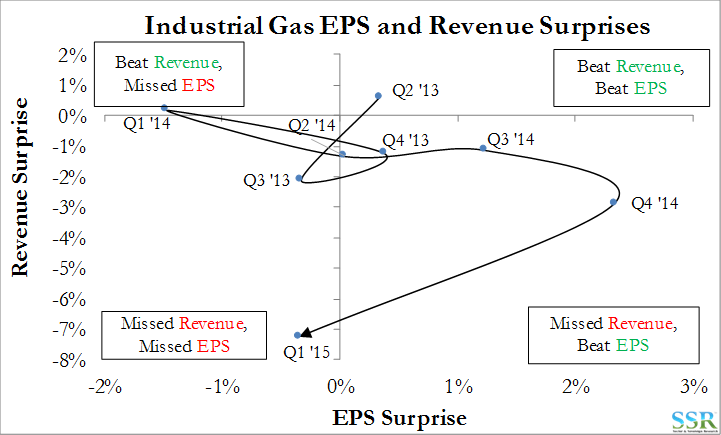 If we draw the same chart for Industrial Gases – only PX and APD – and start from where valuations and revenue growth peaked, we get a different random walk – Exhibit 12 – but a larger earnings and revenue miss in Q1 2015, which we believe signaled the point at which the sector had cut as much cost as was possible (where we think the coatings sector might be today). The exception would be SHW and the VAL synergies but we would argue that these are more than priced in – see the section below. 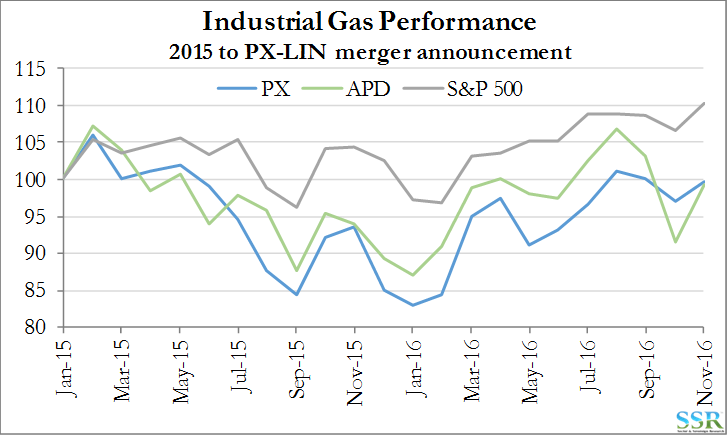 Exhibit 13 shows how the Industrial Gas companies performed relative to the S&P 500 post Q1 2015 until the PX/LIN deal was rumored a year ago – we suspect that the underperformance of the sector would have continued had it not been for this announcement. Any company who either believes that the market is peaking or is a believer in potential longer-term disruption, should be a seller – whether you are a large publicly traded entity or small and family owned. For smaller companies – sell to the big guys today – tomorrow’s price will probably be lower. 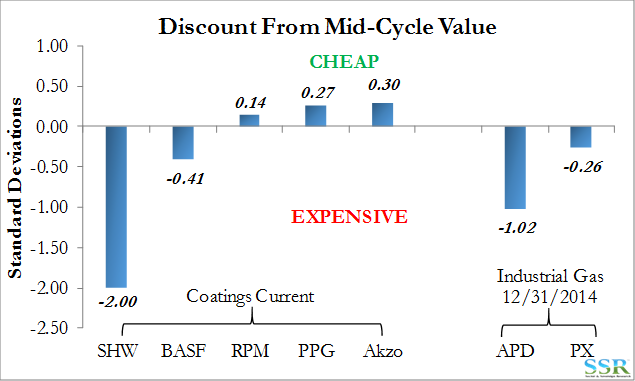 Even niche Industrial Coatings companies probably cannot match the R&D capabilities of PPG, SHW, Axalta and Akzo – all of these companies are getting bigger and more difficult to compete with through smaller and medium sized acquisitions (large in the case of SHW). Align partnerships and R&D with the possible disruptors. We remain most concerned with valuation at SHW, especially if we see price erosion at the company owned stores in order to compete with the DIY stores. SHW has significant positions at Home Depot and Lowes, but gains here at the expense of company owned store “same store sales” would likely result in margin and profit erosion – SHW estimates look very ambitions given the macro analysis above. SHW return on capital is seen by many as an asset but we now see it as a risk – there is so much money in the business that it becomes a target for disruption. 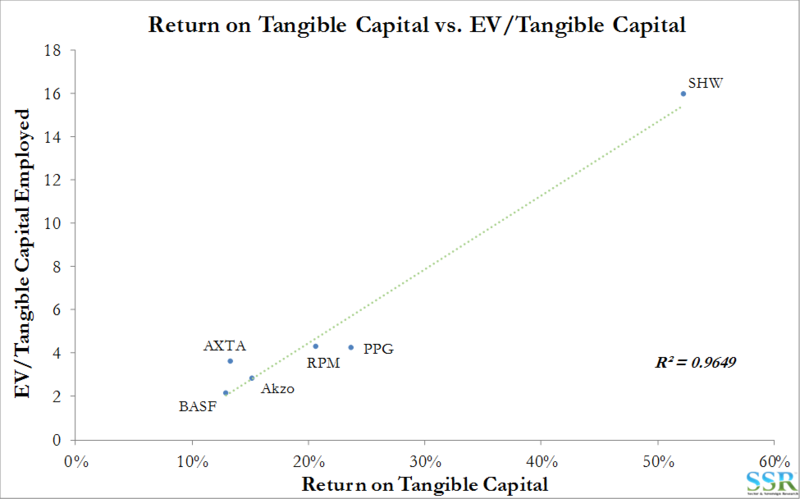 We are taking PPG off our favored list (despite its relative attractive value – Exhibits 14-16) as at this point with all these names you are gambling – who wins and who loses in what will inevitably be another round of restructuring has binary stock outcomes for many. The safest bet is that Axalta will probably be acquired – but maybe not until it has missed several more quarters and valuation makes sense for a buyer. In a number of markets, we have seen how hard it is to get back to “normal” returns and valuation when either growths lows or peaks. The path for PPG, Akzo and RPM to return to normal value (Exhibit 14) needs collaboration from the end markets, which we do not have today.